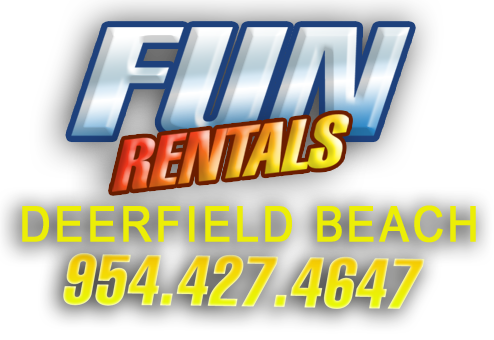 Island Water Sports was founded in 1978 and is one of the longest standing businesses in Deerfield Beach. We are a family owned and operated surf and skate shop and offer a wide variety of surfboards, skateboards, beach accessories, and surf and skate clothing. Need to learn to surf?? We offer FREE surf, skim and stand up paddle board lessons every Saturday at 7:00 a.m.
Do you hate trying to park near the beach? Would you like to stop at local restaurants and other destinations without worrying about driving, parking, or walking? Contact BeachRidesUSA or hail them as they're driving by. They'll give you a ride for free! For details, please visit their website. Renting a boat from Daily Boat Rentals is easy. Enjoy an exciting day on the ocean or a pleasure cruise on the Intracoastal. All of their name brand boats are safety equipped, ocean ready and cleaned for you. Please visit their website for more info. Rentals for all of your family needs: baby equipment, medical equipment, events/parties, furniture, bicycles, etc. Their rental delivery service is available 24 hours a day, 7 days a week. For more info and details, please visit their website. Fun Rentals offers Scooter Rentals, Bicycle Rentals, Kayak Rentals, Street Carts and the world famous Scoot Coupe mini car. For more info, please visit their website.